As a child, Joseph D. Wilkins' (M.S. '01/AHP; D.P.T. '06/AHP; M.S.H.A. '11/AHP) father was involved in a serious car crash. That event planted the seeds of his career path. "From the seventh grade, I wanted to go into physical therapy," he says. "After seeing the therapy that helped my father mobilize himself, I wanted to help people walk again. It had a huge impact on me and what I wanted to do." But as he searched for a way to attend graduate school at VCU and pursue his dream of becoming a physical therapist, he realized he was going to need some help. "Early on, as an undergraduate at William and Mary, I was on an academic scholarship, then I converted to a football scholarship," Wilkins says. "So coming into graduate school, I was on my own. It seemed a little daunting, but I knew there was a light through the tunnel. I'd be able to survive and support myself." A scholarship from the Sue Hirt Fund enabled Wilkins to focus on being a full-time physical therapy student. "The scholarship helped pay my rent, buy food and provide essentials such as clothing. I dedicated my time to school because of the help it provided." Sue Hirt, RPT, M.Ed., was a teacher who made an astounding difference not only in students' lives but also to an entire profession. 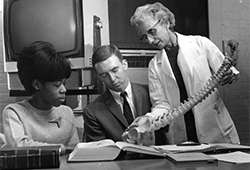 As chair of what is now the Virginia Commonwealth University School of Allied Health Professions' Department of Physical Therapy from 1948 until her retirement in 1982, Hirt "was largely responsible for establishing [the department] as one of the premier programs in the country," wrote former Chair Thomas Mayhew, Ph.D. (Ph.D.'91/M), in a 2007 alumni newsletter. After Hirt retired, she established a fund in the physical therapy department with $4,000. It was used at the chair's discretion to help students cover the cost of books, tuition and other needs. Today, the Sue Hirt Fund tops $500,000, with gifts to the fund from four decades of her students. "She was so beloved by her former students," says Cecil B. Drain, Ph.D., CRNA, FAAN, FASAHP, professor and dean of the VCU School of Allied Health Professions. The fund contributions, he says, are a tremendous display of respect. Margaret Hukill (B.S. '49/AHP; M.S. '57/AHP) was one of Hirt's grateful students and one of the more recent contributors to the fund. After Hukill's death in 2014, the Sue Hirt Fund received a $45,270 gift annuity from her estate to help further the work of the department through student support. "I'd venture to say that approximately 200 to 250 students have received awards since [the fund's] creation," Drain says. "This endowment fund allows us to help students in their hour of need." Award amounts vary and are considered on a case-by-case basis. As for Wilkins, his determination and focus paid off. After clinical experiences in Virginia specializing in spinal cord injuries and rehabilitation, he turned his attention to leadership and now serves as the chief operating officer of Raleigh General Hospital in Beckley, West Virginia. "I realized I could do more and help more people by serving in a leadership role," he says. "My health administration degree opened my eyes and helped me see a broader picture in health care." Wilkins is thankful for the financial help he received at VCU, which he credits for his ability to impact the lives of many, from patients to colleagues. He is only one one of hundreds of VCU physical therapy scholarship recipients who have been able to fulfill a professional dream through the generations of gifts to the Sue Hirt Fund. The payout for charitable gift annuities vary depending on age. Please contact us to inquire about your potential payout rate or if you have any questions about charitable gift annuities.